Even a cerulean sky can't measure up to the beauty of this gemstone ring from Apples of Gold. This solitaire gemstone piece boasts a scintillating aquamarine gemstone that offers light blue color in a truly impressive stone. The aquamarine gemstone measures 4mm, 5mm, 6mm or 7mm for a splash of intense shimmer. The stone is round cut and set in a four-prong setting to ensure this stone rests beautifully on her finger. The band is made of high quality silver and polished to perfection. 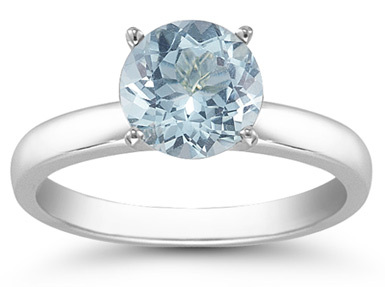 We guarantee our Aquamarine Solitaire in Sterling Silver to be high quality, authentic jewelry, as described above.